Transcripts appeal to a wider audience: Reading is always faster than listening, so converting your content into text will actually attract a lot of readers as opposed to just listeners for your podcast. Also, syndication of content is a lot easier in text than audio and this will help you reach a much wider audience. Transcripts are SEO friendly: Text is indexed by Google and Bing and adding transcripts to your website along with the audio file will greatly help in your discoverability. You are already doing the most difficult part of creating content and by converting your audio to text is guaranteed to have a positive impact on your SEO. Transcripts complement your primary content: It is often quite difficult to absorb content in the audio format and having a text backup will help your audience to revisit your content in a more easily digestible format. It also makes the in-site search a lot easier. Transcripts make referencing and backlinking easy: Referencing to particular parts of your content/site is a lot easier in text format that audio. And if you want to complement your content with a few references, adding links to text is a lot simpler. Referencing brings more credibility to your content. 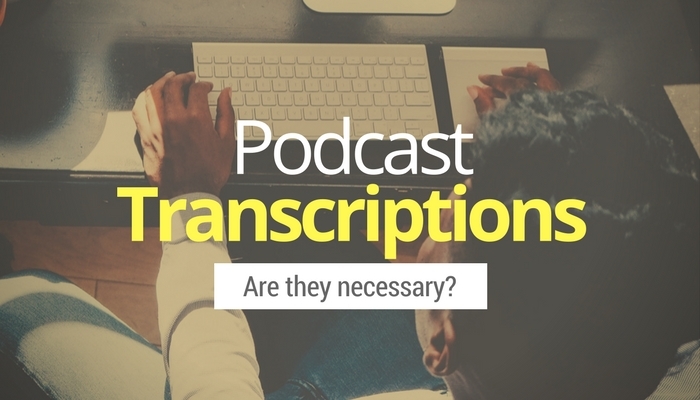 Of all these benefits of transcribing your podcast, we would argue that the most important one is the SEO aspect of it. The most difficult part of any content monetization or distribution is creating the right content and you would be leaving money on the table if you do not reach out to a whole new audience base by the simple act of converting your audio to text. And podcast transcription need not be very expensive and we are not just saying that. You can get your audio transcribed at as low as $0.75 per minute and Scribie offers nothing less than 99% accuracy for podcasters with our gold standard 4-step transcription process. So what are you waiting for? Get your podcast transcribed today from the most popular podcast transcription service provider.